Chasing | Life is Good… But the Best is Yet to Come! The Daily Question is: What are you chasing at the moment? Hmmm… I’m getting ready to chase my 6 1/2 month old! 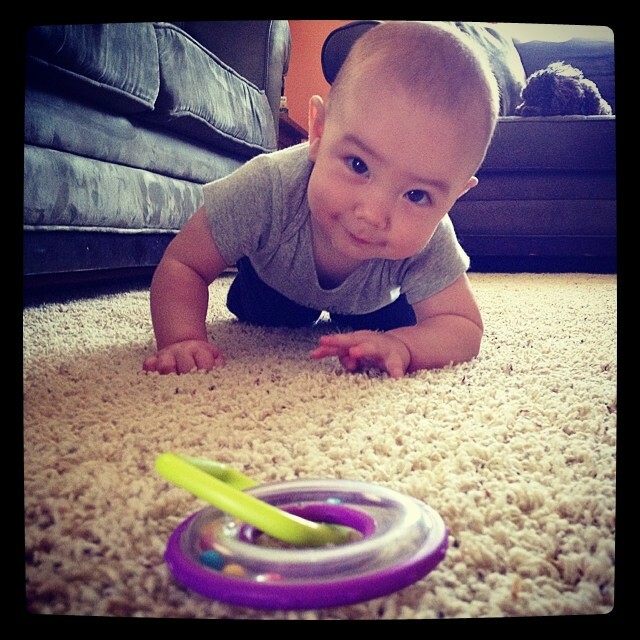 He’s “army crawling” now and able to make his way across the room… So, any day now, he’ll be on the move! Getting into things every time my back is turned. Good grief. I’m so not ready for that! I think for the first time in my life – I’m at rest for the moment. And it’s a weird sensation. Career goals are on hold. Vacation and travels are on hold – or, at least, majorly simplified! The dreams of moving and buying a house are on hold for a few years. The only thing I can think of that I’m “moving toward” is my weight loss and getting back into healthy habits. And maybe, returning to my crafty, loves-to-cook self. But neither of those goals are being “chased” – just gradually re-entered. When I think of “chasing” something, it feels like it’s urgent. It’s needed. It’s something that you put all your energy towards until you reach it. There’s a goal that must be met, before you can rest and feel content – or happy, for that matter. I’m not chasing right now. Thank goodness. Life is good. I do rest (when the kid rests). And I am content (even as I sit here mid-morning, in my yoga pants and hoodie, no make-up, hair in a ponytail, with cold coffee on the desk and no plans for the day other than crawling around on the floor, reading books, experimenting with peas and apples, and giggling at peek-a-boo!). And I’m happy. Very happy. And I’ll miss this. I know I will. The simplicity. The overwhelming love. The cuddles and wonder. So, no. I’m not chasing anything at the moment – and next week, it will probably be the little one. And that’s ok. Actually… It’s so, so good! What are you chasing at this moment? I’d love to hear!